The leaders and activists of Bangladesh Chhatra League (BCL) allegedly assaulted some quota movement activists and teachers of Dhaka University again on Sunday and foiled their human chain at the Central Shaheed Minar premises. The BCL leaders and activists swooped on them and physically assaulted six quota protesters and three teachers when they formed a human chain around 12 noon demanding immediate release of the arrested quota movement leaders and punishment of attackers, said witnesses. The three teachers are Professor Fahmidul Haq and Associate Professor Abdur Razzaque Khan of Mass Communication and Journalism Department and Associate Professor Mohammad Tanzimuddin Khan of International Relations Department. Contacted, BCL General Secretary SM Jakir Hossain denied involvement of any BCL leaders and activists in the attack. He claimed it to be a clash between two groups of quota protesters. General students and teachers of the university, however, said there is no basis of such claim as there is no rift among the quota reform activities. In April, students of public and private universities across the country waged a strong movement demanding reforms in the quota system in public service recruitment process. In the face of the movement, Prime Minister Sheikh Hasina announced in parliament on April 11 the abolition of all types of quotas in public jobs. 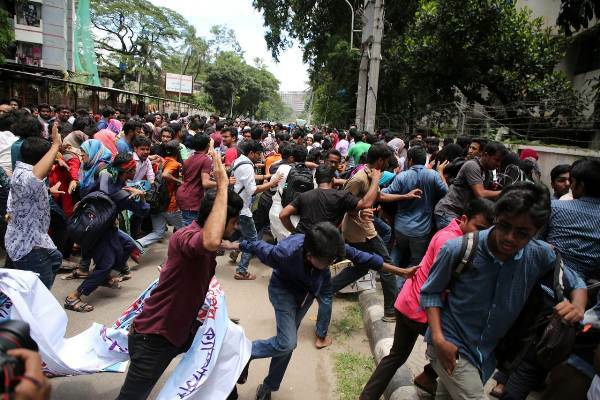 As no gazette notification has so far been issued regarding the abolishment of the quota system as per the PM’s declaration, the leaders and activists of Bangladesh General Students' Rights Protection Council, a platform that leads the quota reform movement, resumed their protests at different public universities and they repeatedly came under attacks allegedly by BCL men. Amid the movement, the Prime Minister on Thursday in parliament said that it is not possible to change freedom fighters’ quota in public jobs due to a High Court verdict.